18 tracks: The Hornes Set * The Occasionals Jigs * The Highland Wedding * Orkney Memories * The West Ringing Set * The Capstan Two-Step * Gaelic Melodies * Northern Reels * A Drop of Brandy * Set of Marches * Cold Winds * The Hebridean * The Celebration * Happy We’ve Been * Irish Jigs * The Percy French Set * The Old 2/4’s * Dumfries and Galloway Reels. 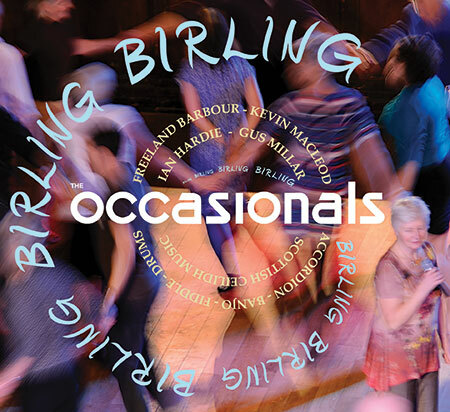 The Occasionals ceilidh band started in 1986, featuring a number of great musical friends. Over time it naturally distilled into the quartet of musicians heard here on this, their seventh recording: Freeland Barbour, Ian Hardie, Kevin MacLeod and Gus Millar. This album is a celebration of 25 years of playing dances at many different occasions, and the band has included some old classics, lesser known gems from Jimmy Shand and Bobby MacLeod, and a good few new ones from Freeland. For those of you less familiar with the Occasionals, Freeland Barbour leads on accordion, Ian Hardie plays fiddle, Kevin MacLeod (who is key to the Occasionals unique sound) plays banjo, mandolin and tenor guitars, while Gus Millar is on drums. The band is hugely popular amongst their legions of fans in Scotland and beyond and an evening with The Occasionals is always a memorable one. This is their sixth album for Greentrax. Their previous album was The Full Set, a very exciting package with twelve dances on DVD, historical footage of the band on tour, written instructions for the dances and a CD with the music for these dances plus bonus tracks. The other Occasionals albums on Greentrax are Back In Step, Live From The Music Hall, Reel Of Four and Down To The Hall. The album was recorded at Castle Sound Studios, Pencaitland, by Stuart Hamilton and True North Studios, Nairn, by Ken Allardyce, in May and June respectively, in 2012. The album contains some tracks for dancing and others for just sheer listening pleasure, but all guaranteed to gain the band many more fans. Design is by band member Kevin MacLeod.